It is replaced by the AML Monarch. Provide finger touch navigation to menu selections and help users find the information they want, when they want it. 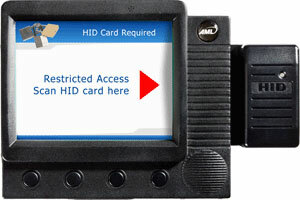 The AML KDT750 Price Verification System is a user-friendly, full-feature price verification system that delivers outstanding functional value in a compact, space-saving footprint. Featuring simple touch screen navigation and a 5.6" full VGA color display, the KDT750 allows retailers to deploy applications that engage customers and enhance the shopping experience right at the point of purchase. 1D omnidirectional laser scanner, 802.11g, Internal UPS and battery, PoE is standard. If PoE not used must purchase power supply (Part# PWR-8050), not included). See accessories. 1D single-line laser scanner, 802.11g, Internal UPS and battery, PoE is standard. If PoE not used must purchase power supply (Part# PWR-8050), not included). See accessories. 2D imager, 802.11g, Color touchscreen, multiple USB and RS-232 Serial ports, internal UPS and battery, PoE is standard. If PoE not used must purchase power supply (Part# PWR-8050), not included). See accessories. CCD scanner, 802.11g, Color touchscreen, multiple USB and RS-232 Serial ports, internal UPS and battery, PoE is standard. If PoE not used must purchase power supply (Part# PWR-8050), not included). See accessories. No scanner, 802.11g, Color touchscreen, multiple USB and RS-232 Serial ports, internal UPS and battery, PoE is standard. If PoE not used must purchase power supply (Part# PWR-8050), not included). See accessories. 1D omnidirectional laser scanner, BATTERY, PoE is standard. If PoE not used must purchase power supply (Part# PWR-8050), not included). See accessories. 1D single-line laser scanner, Color touchscreen, multiple USB and RS-232 Serial ports, internal UPS and battery, PoE is standard. If PoE not used must purchase power supply (Part# PWR-8050), not included). See accessories. 2D imager, Color touchscreen, multiple USB and RS-232 Serial ports, internal UPS and battery, PoE is standard. If PoE not used must purchase power supply (Part# PWR-8050), not included). See accessories. CCD scanner, Color touchscreen, multiple USB and RS-232 Serial ports, internal UPS and battery, PoE is standard. If PoE not used must purchase power supply (Part# PWR-8050), not included). See accessories. No scanner, Color touchscreen, multiple USB and RS-232 Serial ports, internal UPS and battery, PoE is standard. If PoE not used must purchase power supply (Part# PWR-8050), not included). See accessories. 802.11g, 1D omnidirectional laser scanner, PoE is standard. If PoE not used must purchase power supply (Part# PWR-8050), not included). See accessories. 802.11g, 1D single-line laser scanner, PoE is standard. If PoE not used must purchase power supply (Part# PWR-8050), not included). See accessories. 2D imager, 802.11g, Color touchscreen, multiple USB and RS-232 Serial ports, PoE is standard. If PoE not used must purchase power supply (Part# PWR-8050), not included). See accessories. CCD scanner, 802.11g, Color touchscreen, multiple USB and RS-232 Serial ports, PoE is standard. If PoE not used must purchase power supply (Part# PWR-8050), not included). See accessories. No scanner, 802.11g, Color touchscreen, multiple USB and RS-232 Serial ports, PoE is standard. If PoE not used must purchase power supply (Part# PWR-8050), not included). See accessories.